Football legend Patrick Vieira last week visited a UNICEF-supported school, PAH-U7, in Dakar, the capital of Senegal, during a visit to the country to lend his support to the Western Union PASS initiative. The global payment service company is harnessing both its position as a Global Partner of the UEFA Europa League and the power of football to deliver much-needed funding for secondary school education for disadvantaged young people in Senegal, focusing on increasing the transition rate of adolescents from primary school to secondary school. In collaboration with UNICEF — who is working with partners to deliver education programs in Senegal and other countries — Western Union’s PASS initiative is converting every successful pass during its three-year Global Partner sponsorship of the UEFA Europa League into better education for vulnerable children around the world. In Senegal, great efforts have been made to improve children’s access to school; currently, the enrollment rate for free primary school is 94 percent. However, last year, just 58 percent of children in Senegal enrolled in junior secondary school (grades 7-10), and only 29 percent are enrolled in senior secondary school (grades 11-13). Secondary school costs, which include registration fees, as well as the cost of uniforms and transportation to and from the classroom, average $300 per year. This represents approximately 20 percent of the average annual family income of $1500. Funds from Western Union’s PASS initiative will support the transition of 200 adolescents from primary to secondary education in three targeted regions – Matam, Kedougou and Tambacounda – with grants of $300 provided to each student per year for two years. The funds will help students to overcome financial barriers that hinder their access to school, covering registration fees and costs including learning materials, uniforms, meals at school and transport to and from school. Schools and students will be selected in close cooperation with the Office of Academic Inspection within the Ministry of Education as well as school directors, targeting the most vulnerable and poor children in remote areas where access to and retention of students in junior secondary school is challenging. The academic inspectors will work closely with school directors to track the distribution of the grants and local parent-teacher associations will closely monitor participating students’ progress through home visits. The Western Union PASS funds will also help UNICEF Senegal promote an awareness campaign targeting approximately 3,000 young girls in the three regions on the importance of junior secondary education and the prevention of early marriage and pregnancy – two obstacles that can stop girls from completing their education. Approximately 35 percent** of girls in the most disadvantaged regions are forced into early marriage as a source of revenue for their families. “I have been proud to support the Western Union PASS initiative since September 2012 and I am really happy to come back again to Senegal to learn more about the initiative and see the impact of UNICEF education programmes. 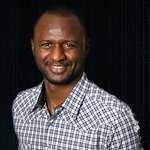 Senegal is a young country and providing a quality education for the country’s youth is critical for Senegal’s growth and development”, commented World Cup winner Patrick Vieira, who also has his own Foundation in the country, during his visit to the PAH-U7 school and its 550 primary students in a suburb of Dakar. Through the PASS initiative, Western Union aims to support the delivery of one million days of education through its partnership with UNICEF. It is a key part of Western Union’s broader Education for Better program, launched at the UN General Assembly in September 2012, which includes philanthropic grants from the Western Union Foundation, advocacy, products, volunteer and marketing support for secondary and vocational education. To date the total number of passes contributing to the PASS campaign stands at 356,564. Funding has already been delivered on the ground to UNICEF in Jamaica, Nigeria and Turkey, with support from Western Union for education programs in Brazil, Senegal, Morocco and China scheduled for this year.